Kids like to create huge things, yet huge things are usually expensive or massive, so what about turning ordinary objects into kids design? Drinking straws or unwanted cardboard boxes are a perfect example of low-cost objects that can challenge children to think at an architectural scale and become pilots of their own starships. Strawbees has been developed by a company called Createables and led by Erik Thorstensson, Petter Danielson, and Oscar Ternbom. Since this clever kit has been invented, it has been an extremely popular tool to teach STEM education at schools, museums, libraries and maker spaces. Its endless possibilities and its mechanical and structural properties allow children to experience engineering principles in real life. With the mission of being a pivotal part of creative and science education now and in the future, Strawbees has been designed having in mind firstly the availability and endurance for subsequent minimal carbon footprint and waste. That’s why Strawbees is nearly a carbon neutral and low-cost product that ensures availability for everyone. On the other hand, designers wanted to make science education more fun. To educate future inventors it is necessary to promote a trial-and-error based learning. To achieve it they have been supported by world class educators who believe in young’s ability to think freely and out of the box. 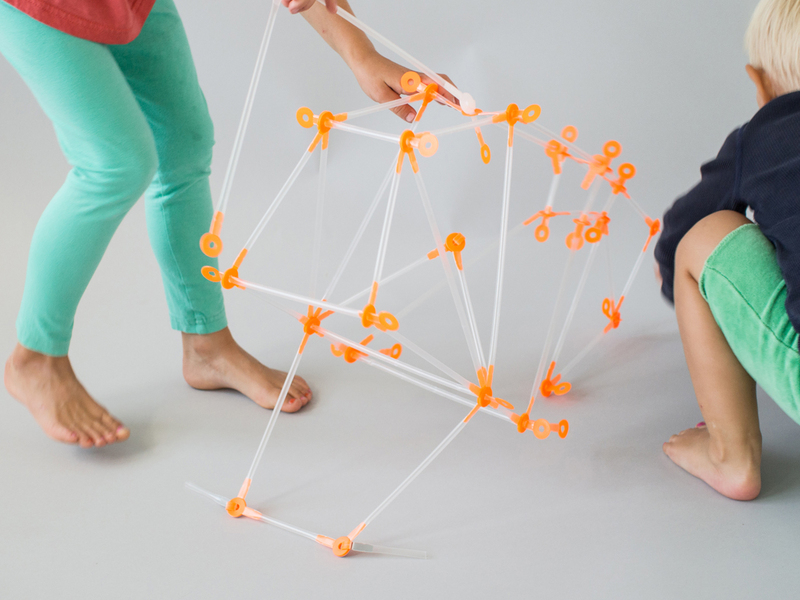 As we can see, Strawbees is a construction kit based on one simple connector that lets children fix straws and cardboards to each other, turning ordinary objects into kids design and helping them to extend their creativity and imagination using just these simple materials. Even if the system is meant to be completely open-ended, there is a “Become an Inventor” iPad app whith guided projects, taking the user from understanding basic construction, applied physics, mechanics and mathematics. The app is based on a progression path taking the user from a Strawbees beginner level to being able to create and design in three dimensions. You can find different kits like for example the infinite kit which changes the construction kit paradigm by allowing the purchase of a manufacturing machine of parts. This making machine allows for instance schools to manufacture as many pieces as are needed using any plastic waste, like juice jugs. Strawbees has also a new “sister toy” called Quirkbot which is a programmable robot, that makes creations express themselves and interact with their environment through sound, light and motion. This toy mix is an unbeatable combination for learning engineering and programming, and affordable price. Like many DIY robot toys, this requires some programming. Fortunately, it comes bundled with a drag-and-drop-based software that kids as young as 10 can easily handle. So, get ready to think big and build bigger while turning ordinary objects into kids design next time you do!